Talking With Docs Published on July 24, 2018 – Dr. Paul Zalzal and Dr. Brad Weening discuss different surgical approaches to hip replacement surgery. There has been a lot of interest in the anterior hip approach recently. This video compares anterior approach to lateral and posterior approaches. Do NOT use the Video for medical emergencies. If you have a medical emergency, call a physician or qualified healthcare provider, or CALL 911 immediately. Under no circumstances should you attempt self-treatment based on anything you have seen or read on the Video. Posted by Melissa Chefec NEW YORK & GREENWICH, CT. (PRWEB) April 13, 2018 – Dr. Kevin Plancher with Plancher Orthopaedics & Sports Medicine with tips for understanding the pros and cons of both approaches to treating knee and hip pain. When chronic knee or hip pain from arthritis or injury becomes a daily struggle, undergoing joint replacement surgery may become a tempting option. But is there a role for growth factors or stem cell therapy if the arthritis is mild? It’s a question orthopaedic surgeon Kevin D. Plancher, MD, is asking and attempting to answer as treatment advances offer patients options beyond what’s been available for many years. Joint Replacement Awareness Day® is the first-ever, online educational event for people suffering from joint pain and considering, planning, or having had hip or knee replacement surgery. This one-day event will bring together leading orthopedic surgeons and patients to share their knowledge and stories. NewswireToday – /newswire/ – New York, NY, United States, 2017/06/28 – Persistence Market Research (PMR), in its report, estimates global hip replacement market to reach 4.1% CAGR during 2016-2024. The report also focuses on key trends and factors driving the growth of hip replacement market. Hip bone infection, the rising problem of arthritis, hip fractures, manufacturers extending product line, clinicians concerned about patient safety, rising innovation and new hip implants including 3D printing technology and minimally invasive surgeries are the key factors boosting the growth of hip replacement market. 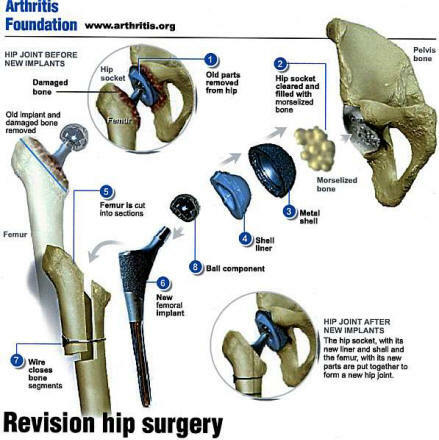 For total hip replacement, the 10-year implant survival rate was 95-96 percent, and the 20-year rate 85 percent. Former Cincinnati Reds catcher Johnny Bench spoke at the joint pain seminar at OakLeaf Surgical Hospital in Altoona. Bench underwent total hip replacement in his right hip in 2004. After undergoing the procedure, Bench was able to realize his lifestyle recovery goals and get back to his active life without hip pain. Paper 773, presented at the AAOS 2014 Annual Meeting, March 11-15, 2014, New Orleans, Louisiana. …The purpose of the present study was to evaluate the clinical, radiographic and functional outcomes of Charnley total hip arthroplasty (THA) in patients under age 50 (a group that continues to actively function with their THA) at minimum 35 years of follow up…. Rates of publicly-funded knee and hip replacement surgery are barely keeping up with population increases, and many people are missing out on surgery despite significant disability, according to two new studies published in the New Zealand Medical Journal. An accompanying editorial notes that attracting funding for this “life changing” surgery has been difficult given the prioritisation of healthcare spending on specialties involving “cancer, cardiac or kids”. physiologically loading hip solution for today’s challenging, active patient. proximal stability, that may allow increased activity levels.